Paolo Caliari, known as Paolo Veronese (1528 – 19 April 1588), was an Italian Renaissance painter, based in Venice, known for large-format history paintings of religion and mythology, such as The Wedding at Cana (1563) and The Feast in the House of Levi (1573). Included with Titian, a generation older, and Tintoretto, a decade senior, Veronese is one of the "great trio that dominated Venetian painting of the cinquecento" and the Late Renaissance in the 16th century. Known as a supreme colorist, and after an early period with Mannerism, Paolo Veronese developed a naturalist style of painting, influenced by Titian. His most famous works are elaborate narrative cycles, executed in a dramatic and colorful style, full of majestic architectural settings and glittering pageantry. His large paintings of biblical feasts, crowded with figures, painted for the refectories of monasteries in Venice and Verona are especially famous, and he was also the leading Venetian painter of ceilings. Most of these works remain in situ, or at least in Venice, and his representation in most museums is mainly composed of smaller works such as portraits that do not always show him at his best or most typical. He has always been appreciated for "the chromatic brilliance of his palette, the splendor and sensibility of his brushwork, the aristocratic elegance of his figures, and the magnificence of his spectacle", but his work has been felt "not to permit expression of the profound, the human, or the sublime", and of the "great trio" he has often been the least appreciated by modern criticism. Nonetheless, "many of the greatest artists ... may be counted among his admirers, including Rubens, Watteau, Tiepolo, Delacroix and Renoir". Veronese took his usual name from his birthplace of Verona, then the largest possession of Venice on the mainland. The census in Verona attests that Veronese was born sometime in 1528 to a stonecutter, or spezapreda, named Gabriele, and his wife Catherina. He was their fifth child. It was common for surnames to be taken from a father's profession, and thus Veronese was known as Paolo Spezapreda. He later changed his name to Paolo Caliari, because his mother was the illegitimate daughter of a nobleman called Antonio Caliari. His earliest known painting is signed "P. Caliari F., "the first known instance in which he used this surname", and after using "Paolo Veronese" for several years in Venice, after about 1575 he resumed signing his paintings as "Paolo Caliari". 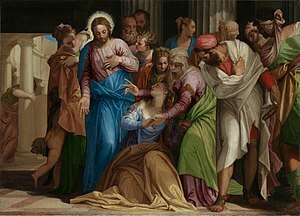 He was often called "Paolo Veronese" before the last century to distinguish him from another painter from Verona, "Alessandro Veronese", now known as Alessandro Turchi (1578–1649). By 1541, Veronese was apprenticed with Antonio Badile, who was later to become his father-in-law, and in 1544 was an apprentice of Giovanni Francesco Caroto; both were leading painters in Verona. An altarpiece painted by Badile in 1543 includes striking passages that were most likely the work of his fifteen-year-old apprentice; Veronese's precocious gifts soon surpassed the level of the workshop, and by 1544 he was no longer residing with Badile. Although trained in the culture of Mannerism then popular in Parma, he soon developed his own preference for a more radiant palette. In his late teens he painted works for important churches in Verona, and in 1551 he was commissioned by the Venetian branch of the important Giustiniani family to paint the altarpiece for their chapel in the church of San Francesco della Vigna, which was then being entirely rebuilt to the design of Jacopo Sansovino. In the same year he worked on the decoration of the Villa Soranzo near Treviso, with his fellow Veronese Giovanni Battista Zelotti and Anselmo Canneri; only fragments of the frescos remain, but they seem to have been important in establishing his reputation. The description by Carlo Ridolfi nearly a century later mentions that one of the mythological subjects was The Family of Darius before Alexander, the rare subject in Veronese's grandest treatment of secular history, now in the National Gallery, London. In 1552 Cardinal Ercole Gonzaga, great-uncle of the ruling Guglielmo Gonzaga, Duke of Mantua, commissioned an altarpiece for Mantua Cathedral (now Caen, France), which Veronese painted in situ. He doubtless used his time in Mantua to study the ceilings by Giulio Romano; it was a painter of ceiling frescos that he would initially make his mark in Venice, where he based himself permanently from the following year. Veronese moved to Venice in 1553 after obtaining his first state commission, ceilings in fresco decorating the Sala dei Cosiglio dei Dieci (the Hall of the Council of Ten) and the adjoining Sala dei Tre Capi del Consiglio in the Doge's Palace, in the new rooms replacing those lost in the fire of 1547. His panel of Jupiter Expelling the Vices for the former is now in the Louvre. He then painted a History of Esther in the ceiling for the church of San Sebastiano (1556–57). It was these ceiling paintings and those of 1557 in the Marciana Library (for which he was awarded a prize judged by Titian and Sansovino) that established him as a master among his Venetian contemporaries. Already these works indicate Veronese's mastery in reflecting both the subtle foreshortening of the figures of Correggio and the heroism of those by Michelangelo. By 1556 Veronese was commissioned to paint the first of his monumental banquet scenes, the Feast in the House of Simon, which would not be concluded until 1570. Owing to its scattered composition and lack of focus, however, it was not his most successful refectory mural. In the late 1550s, during a break in his work for San Sebastiano, Veronese decorated the Villa Barbaro in Maser, a newly finished building by the architect Andrea Palladio. The frescoes were designed to unite humanistic culture with Christian spirituality; wall paintings included portraits of the Barbaro family, and the ceilings opened to blue skies and mythological figures. Veronese's decorations employed complex perspective and trompe l'oeil, and resulted in a luminescent and inspired visual poetry. The encounter between architect and artist was a triumph. The Wedding at Cana, painted in 1562–1563, was also collaboration with Palladio. It was commissioned by the Benedictine monks for the San Giorgio Maggiore Monastery, on a small island across from Saint Mark's, in Venice. The contract insisted on the huge size (to cover 66 square meters), and that the quality of pigment and colors should be of premium quality. For example, the contract specified that the blues should contain the precious mineral lapis-lazuli. () The contract also specified that the painting should include as many figures as possible. There are a number of portraits (including those of Titian and Tintoretto, as well as a self-portrait of Veronese) staged upon a canvas surface nearly ten meters wide. The scene, taken from the New Testament Book of John, II, 1–11, represents the first miracle performed by Jesus, the making of wine from water, at a marriage in Cana, Galilee. The foreground celebration, a frieze of figures painted in the most shimmering finery, is flanked by two sets of stairs leading back to a terrace, Roman colonnades, and a brilliant sky. In the refectory paintings, as in The Family of Darius before Alexander (1565–1570), Veronese arranged the architecture to run mostly parallel to the picture plane, accentuating the processional character of the composition. The artist's decorative genius was to recognize that dramatic perspectival effects would have been tiresome in a living room or chapel, and that the narrative of the picture could best be absorbed as a colorful diversion. These paintings offer little in the representation of emotion; rather, they illustrate the carefully composed movement of their subjects along a primarily horizontal axis. Most of all they are about the incandescence of light and color. The exaltation of such visual effects may have been a reflection of the artist's personal well-being, for in 1565 Veronese married Elena Badile, the daughter of his first master, and by whom he would eventually have a daughter and four sons. Also painted between 1565–70 is his Madonna and Child with St. Elizabeth, the Infant St. John the Baptist, and St. Justina in the Timken Museum of Art, San Diego. St. Justina, a patroness of Padua and Venice, is at the right with the Blessed Virgin Mother and the Christ child in the center. In contrast to Italian works of a century earlier the infant is rendered convincingly as an infant. What makes one stop and take notice in this painting is the infant's reaching out to St. Justina, since a baby of this age would normally limit his gaze to his mother. Completing the work is St. Elizabeth, the cousin of Mary and mother of St. John the Baptist, located on the left. The artist delicately balances the forms of the extended Holy Family and renders them using a superb balance of warm and cool colors. In 1573 Veronese completed the commission for The Feast in the House of Levi, a last-supper painting for the rear wall of the refectory at the Basilica di Santi Giovanni e Paolo, Castello, Venice. Originally titled The Last Supper, the painting was to replace a Titian painting burnt in a fire; Veronese's oversized (5.55m x 12.80m) replacement depicted a Last Supper banquet scene that included German soldiers, dwarves, and animals — the human and animal exotica usual to Veronese's representational narratives. Artistically, The Feast in the House of Levi indicates Veronese's technical development in using intense and luminous colours for texture, attention to narrative coherence, the acute representation of human emotion, and the psychologically subtle interplay occurring among the characters who crowd the scene. The Feast in the House of Levi (1573) featured people and animals that the Inquisition perceived as heretical. The Inquisitors' investigation found no heresy, yet ordered Paolo Veronese to re-title the painting something other than The Last Supper, the original title. Given the subject of the painting, the biblical Last Supper, the humanistic depictions of the characters lacked the piousness usual to Roman Catholic art depicting the Christ character and the events of his life; and the Inquisition readily noticed Veronese's irreligiosity. 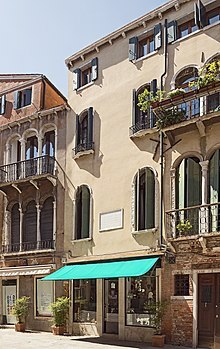 By the 1570s, the theology of the Counter-Reformation had given legal authority to Roman Catholic doctrine in Venice, which was a new, political development for an artist such as Veronese. Professionally, in the Venetian republic of the Late–Renaissance, for an artist, painting crowd scenes had acquired political ramifications regarding who and what appeared in a religious painting commissioned from him, regardless of the patron or patroness. A decade earlier, the Benedictine monks who commissioned The Wedding at Cana (1563) had directed Veronese, as an artist, to freely include as many human figures as would fit in the banquet scene. In contrast, a decade later, Veronese encountered legal, religious constraints that determined the suitability (theological, political, sociological) of who and what he depicted in a painting—thus, on 18 July 1573, the Inquisition legally summoned Veronese before a tribunal, to explain the presence of what Church doctrine considered characters, animals, and indecorum extraneous to an image of the Last Supper of the Christ. The tribunal's interrogation of the painter Veronese was cautionary, rather than punitive; political, rather than judicial; nonetheless, Veronese explained to the Inquisitiors that “we painters take the same liberties as poets and madmen” in telling a story. Although the Inquisition's tribunal ordered Veronese to repaint the last-supper scene, he opposed their remedy to his theological offences, yet was compelled to re-title the painting from the sacramental The Last Supper to The Feast in the House of Levi. That an artist, such as Paolo Veronese, had successfully perdured against the Inquisition's implied accusation of heresy, indicated he had the discreet political support of a patrician patron of the arts. An artist's biography of Paolo Veronese was included to the second edition of the Lives of the Most Excellent Painters, Sculptors, and Architects (1568), by Giorgio Vasari, with an improved coverage of the painters of the Florentine School. The French had no doubts, as the critic Théophile Gautier wrote in 1860, that Veronese was the greatest colorist who ever lived—greater than Titian, Rubens, or Rembrandt because he established the harmony of natural tones in place of the modelling in dark and light that remained the method of academic chiaroscuro. Delacroix wrote that Veronese made light without violent contrasts, "which we are always told is impossible, and maintained the strength of hue in shadow". This innovation could not be better described. Veronese’s bright outdoor harmonies enlightened and inspired the whole nineteenth century. He was the foundation of modern painting. But whether his style is in fact naturalistic, as the Impressionists thought, or a most subtle and beautiful imaginative invention must remain a question for each age to answer for itself. In addition to the ceiling creations and wall paintings, Veronese also produced altarpieces (The Consecration of Saint Nicholas, 1561–2, London's National Gallery ), paintings on mythological subjects (Venus and Mars, 1578, New York Metropolitan Museum of Art ), and portraits (Portrait of a Lady, 1555, Louvre). A significant number of compositional sketches in pen, ink and wash, figure studies in chalk, and chiaroscuro modelli and ricordi survive. He headed a family workshop, including his younger brother Benedetto (1538–98) as well as his sons Carlo and Gabriele, and his nephew Luigi Benfatto (also called dal Friso; 1559–1611), that remained active for a decade or so after his death in Venice in 1588, signing their work "Haeredes Pauli" ("Heirs of Paolo"), and continuing to use his drawings. According to Nicholas Penny, "The role of the workshop seems to have increased steadily, and after 1580 it is rare that we can feel confident that Veronese's was the sole hand involved". Among his pupils were his contemporary Giovanni Battista Zelotti and later, Giovanni Antonio Fasolo, Sigismondo de Stefani, and Anselmo Canneri. The Caliari family continued and another Paolo Caliari published the first monograph on his ancestor in 1888. Veronese was one of the first painters whose drawings were sought by collectors during his lifetime. The Monty Python sketch "The Last Supper" from Monty Python Live at the Hollywood Bowl is based on the story of Veronese's painting The Feast in the House of Levi. An imaginary Veronese painting called La Morte dil Cesare is prominently featured in a story arc of the award-winning comics series 100 Bullets. In the Ascended Master Teachings of Elizabeth Clare Prophet, Paolo Veronese is regarded as one of the earthly embodiments of one of the ascended masters, a group of beings guiding the spiritual destiny of the planet Earth and its people. Specifically, he is regarded as the Master Paul the Venetian, Master of the Third Ray. What's the good word on Paolo Veronese?